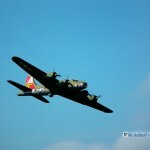 Supposedly the last flight-capable B-17 that was actually used in combat in World War II. Some more (old) details of her current status here; all via Jules Crittenden. Why am I linking? Because she’s a pretty plane . Heck of a thing to say about a war machine and a bomber, but it’s the truth.